and this illuminates the whole of life. The (inner) meaning of Muraqaba - is to preserve the heart from everything other than Allah. The word Muraqaba comes from Raqibun, which in Arabic means the Watchful, Careful Observer, Vigilant, Wakeful. Ar-Raqib is one of the Beautiful Names of Allah, which means the One Who is Ever Watchful. for We are closer to him than his jugular-vein. not even a word can he utter but there is a watcher with him, ever present. Since to Watch with Vigilance is a Divine Quality, the act of watching is a divine action. To watch is also an act of guarding the heart and mind; and therefore is the basis of meditation. Muraqaba is the Sufi word for meditation. Literally it means "to watch over", "to take care of", or "to keep an eye". Metaphorically, it implies that with meditation, a person watches over or takes care of his spiritual heart (or soul), and acquires knowledge about it, its surroundings, and its Creator. Sometime Muraqaba begins with a seed of the verse of the Qur'an, which is the Divine Voice speaking to the heart of man. According to certain Sufi School to begin Muraqaba or meditation one has to pronounce vocally the Kalam (the holy words) upon which meditation is to be done. By humbling one's self, one sits down by facing the Qibla, the direction of Holy Mecca and sits in the posture of salaat (with two knees together). At this point, by clearing the inner heart from the worldly thoughts, one concentrate on the reality of meditation (haqiqat e muraqaba) which is as if one is seeing / watching God and if that is not the level of the seeker, then as if, the seeker is being watched by God. This is the station of excellence (Ihsan) as defined by the Divine Informer, the Seal of Prophets in one of his famous tradition (known as Hadith of Jibreel) in which he transmitted that Ihsan is "that you worship Allah as if you see Him, for if you don't see Him then truly He sees you." Muraqaba e Tawhid e Afwali: This is the meditation of the Oneness of Divine Action, the Singularity of Divine Acting. The method of this is that the seeker establish himself or herself on the truth that Allah is the only Real Doer of all the actions of the entire universe. Whatever and whomsoever seems visible in engaged with action in the world of appearances are to be taken simply as the medium of the Real Agent, Who is God, Who has no partner in His Sovereignty. In every action, every movement both visible and invisible it is Allah Who is to be taken as the Real Doer and the Owner of all Actions. If one meditate on this Tawhid e Afwali, the Oneness of Divine Action - the masters of the path have confirmed that wondrous result will manifest to the meditator's in life. through secret communion with Him. Muraqaba e Tawhid e Sifaati: This is the meditation of the Oneness of Divine Attributes. In this the seeker establish himself or herself on the truth that the entire manifested world, including his or her very self as reflection of Divine Attributes (sifaat) and to immerse into that contemplation. According to the elders of the Path, the benefit of this muraqaba are so much that they can not be enumerated in writing. The meditator in this will gradually start to feel one's own presence in the entire world. He will observe himself as expansive and very vast (wasi). From the earth to the heavens, in everything he will start to feel to be encompassed by his "I am"-ness. He discovers the existence of the entire cosmos within himself. The real significance of every single thing is presented in front of him. And he does not make mistake in this unveiling (kashf) but rather they start to appear to be practical and true. But here the journey of the seeker must not end, rather he should continue to journey to the Being Who is Boundless and Who veils Himself beyond seventy thousand veils of light. At some point the meditator will envision various kind of light, color and effulgence. It will appear to be the divine veils of light. Only through utter humility at the door of the Divine Majesty can one ask permission to journey ahead. Beyond these veils are another kind of subtle (latific) and majestic (jamalic) veils. Reaching beyond which, in sufi terminology is called Sayrfillah (Swimming in the Boundless Being of Allah). There is no end and no boundary at this stage and this is considered as the last frontier of ma'rifa (ultimate Divine gnosis). Muraqaba of Tajalliye Afyal: Tajalli means effulgence, light and Afyal means Action of Allah. In totality the meaning is to meditate upon the effulgence of Allah's Actions. - Durood or Benediction on Prophet Muhammad (such as "O Allah, send your peace and choicest blessings upon our Spiritual Master Muhammad") five times. 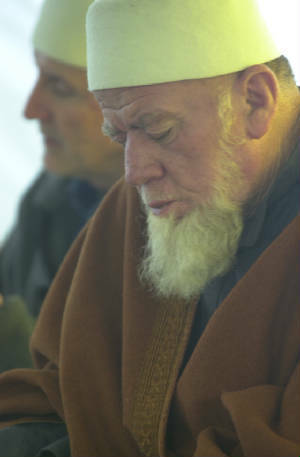 Then the intention is said: "I am giving tawajjuh (focus) on my Qalb (inner heart) and by the mediation of his holiness Prophet Muhammad's blessed Heart, my Qalb is giving tawajjuh towards the 'Arsh (Mystical Divine Throne, the Absolute Divine Presence) of the Lord of the Worlds; and from the 'Arsh of Allah, energy of Tajalliye Afyal may arrive to my Qalb." Or, to state simply: "I am focusing on my Inner heart, and my heart, through the honor of his holiness Muhammad's Heart, is focusing towards the Majestic Throne of God. May the energy of the effulgence of the reality of Divine Action may arrive from the Throne to my Heart." There is no doer but Allah. During this Muraqaba / meditation sincere intention has to be present on part of the meditator that his existence is nothing, his actions are nothing and he is willing to annihilate his finite illusory self into the Infinite and Real. Along with this, the truth upon which one to establish one's self is that the apparent actions issuing from formed and shaped creatures are in reality belongs to Allah and all attributes of the manifest world are borrowed from Divine Attributes. In this the being receive great tranquility of being and the Divine mysteries start to unveil by the permission of Allah, according to the degree of the soul's striving. Different saints and friends of Allah have meditated differently. Some meditate with open gaze towards the open sky without blinking and in that Anwar-e-Ilahi or Light Divine manifests in their vision. In an instant the flame of deep love of the Divine encompass their entire being and in that the permanent love for Allah is stamped upon their heart. This stage is often known as Muraqab-e-Haowa or Sky Meditation. Many Sufis have lost themselves in bewilderment in this meditation and wandered in the place of placeless. Another method of Muraqaba is to sit in a half-darkened or almost darkened small chamber or room and to keenly observe a single ray of light coming from outside or a slice of visible light. In this they start to see the Light Divine (Anwar e Ilahi) and journey for union with the Infinite is accelerated. But this description is inadequate and does not encompass all the preparation of purification of the self (tazkiyatun-nafsx) that one undertakes under the guidance of a spiritual master before one is granted these visions in meditation. Indeed illusion is (by its nature) bound to perish." According to the elders of the Path, this method is very close to reaching one to one's spiritual destination (manzil). The intention for this muraqaba: "I am giving tawajjuh (focused attention) to my heart and by the wasila (mediation) of the pure heart of venerable Muhammad, my heart is paying tawajjuh to the Holiest of Holy in Whom gathers all Divine Names and Attributes. May the energy of Ma'yiat (Divine Accompaniment) arrive from Allah, the Most High. Amen." Wa Huwa Ma'akum aynama kuntum. And the Divine Being is with you, wheresoever you are. In the upcoming posts few other method of muraqaba and their associated kalam (sacred invocation) will be shared, Inshallah. May your Ramadan be a generous one, Ramadan Kareem.